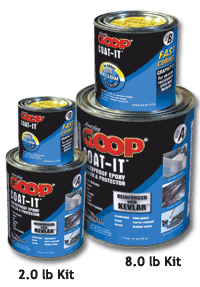 COAT-IT is a 100% solids waterproof epoxy sealer that exhibits extreme toughness and abrasion resistance. It may be applied to aluminum, fiberglass and wood boats. It serves as an excellent waterproof membrane on wood – sealing small leaks and splits with a single coat. COAT-IT contains ceramic beads for abrasion resistance, graphite to provide slip or lubricity when it comes in contact with rocks or gravel and Kevlar fiber (the same fiber used in bullet proof vests) for extreme toughness.